The sign up part of Pitch Live is now closed. Today starts the blogfest part of the contest. Hop around and view each others videos, comment, and meet new friends. You never know what agents will be lurking around the blogs. On October 17 at 8AM EDT the top 30 videos will be on the host blogs for the agents. Check out our agent line up here. The judges/hosts will cruise the blogs and pick their favorite videos. In the comments of the entry posts the judges will let you know if they’ve chosen your pitch for their blog. Go check out the live pitches and come back and vote for your favorite in the comment of this post. We’ll give away some prizes (to be announced) for the top ones. I vote for the two duos. Elizabeth Tybush and F.L Tybush V, and Katherine Ernst and Chelle Bruhn. They were both very enthusiastic and had interesting stories to tell. I vote for John Krissilas. GREAT premise and I love his enthusiasm – it’s sure to come through in the book. I want to read it! I vote for Sarah Blair. The premise of the book is excellent and how adorable is she, really??? So many great pitches, but I loved the actual elevator pitch by Lauren McKellar! AGREE!! Lauren McKeller’s was awesome!!!! LOL! I know!! I wish i had the confidence to pul off something like that!! Lucky I got through my video as is! LOL! I vote for Lauren McKellar. I just love the hip flask swigging pitch! Gosh, so hard – so many awesome pitches! I vote for John Krissilas. Really liked the premise and the simplicity, plus his delivery was very easy to follow. But if I could vote for more… oh boy! Would be here all day. Lauren McKellar reeks of awesomeness. Urgh… Should have read the previous posts and chosen a different adjective. So many good ones, but Lauren McKellar totally has my vote! I mean, how could it not? Oh my goodness, I’m still getting through the Videos, So many good ones. Okay–I watched each Vlog. If I have to pick only one…I’ll say Robin Weeks. It’s my kind of story, and she’s so cute, and she hypnotized me–not into writing this though. See? White dust is powerful stuff! You don’t even know WHAT I’m making you do! 😀 Thanks! Number thirty-eight was really cute. Against the Falling Moons. That one gets my vote. This was so much fun and so many great entries. Really something everyone should try. MUCH harder than it looks. I vote for Sarah Blair! I’m sorry, I have to go with Lauren McKellar, too! Also, I just wanted to post and thank you for putting on this opportunity. Yeah, I felt like I’d totally humiliated myself and I wanted to hide in a closet afterwards, but it was a good experience. I’m looking forward to the next round! I vote for Sarah L Blair. She is freaking adorable and TSD is blow your mind good. I’m voting for Laura Hughes, because her story sounds Aaawweeesome! I had to sleep on it, because sooo many pitches were soooo awesome, but I have to go with the Tybushes for some mad editing skillz, great enthusiasm, and a fun plot to boot. I also loved John Krissilas for enthusiasm, confidence, artwork, and great comments on everyone else’s pitches. Also Amy DeLuca for unbeatable poise. 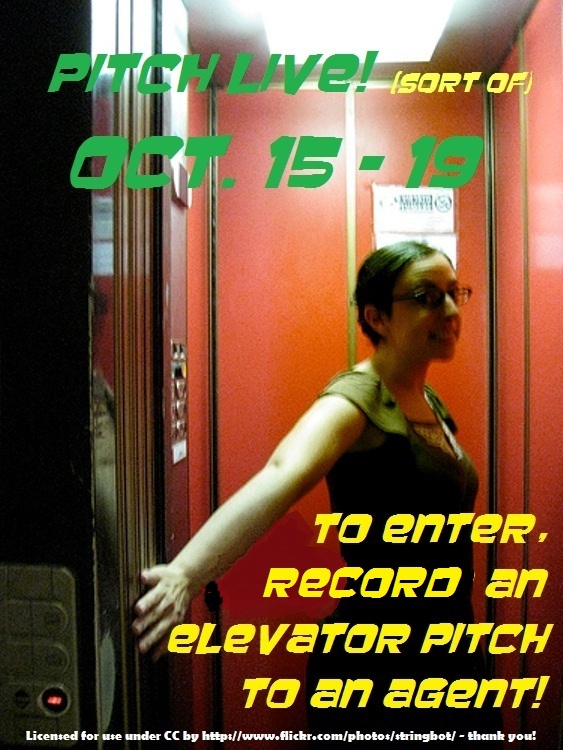 And Lauren McKellar for the most hilariously literal elevator pitch. And Fiona McLaren for spookiness. And… oh, there are so many awesome pitches! I vote for John Krissilas. I just loved his illustrations! The voting for best video has now ended. We’ll announce the winners in tomorrow’s post!